It is our pleasure to announce that we are about to hold a conference on Mars/Lowell for a few days at the very beginning of May 2004 at Anamizu town, Ishikawa-ken, under the joint auspices of the OAA Historical Section, the Lowell Society of Japan and other associations. Anamizu was the terminal of Percival Lowell's trip to the Noto peninsula in 1889, and we already reserved a conference room and a facility for accommodations (belonging to the Kanazawa Institute of Technology) in a good milieu near the place Lowell landed. 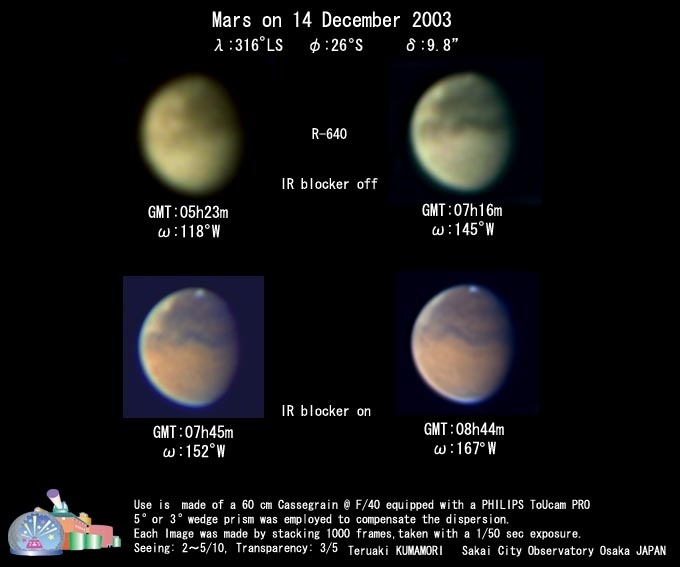 We are planning to discuss at the first half of the days the classical observational problems of Mars (after the great apparition in 2003) and at the second half we shall concentrate on Lowell's variety of personality and thoughts in relations with Mars: We expect the presence of William SHEEHAN, and under his leadership we shall discuss the missed possibility of Lowell. We already opened our Lowell Page, and we continue to discuss the Lowell problem. 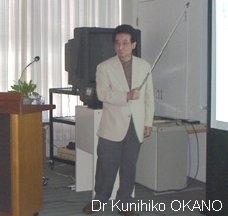 The 11th CMO Meeting was held on 3, 4 and 5 May 2003 at the Fukui City Museum of Natural History. Especially on the afternoon of 4 May, three Lectures were delivered by T NAKAJIMA (Nj), M MURAKAMI (Mk) and K OKANO (Ok) to a large public audience: Nj talked about a fuss and a wave of mass hysteria in 1938 caused by Orson WELLES's radio programme of H G WELLS's The War of the Worlds and suggested modern implications. 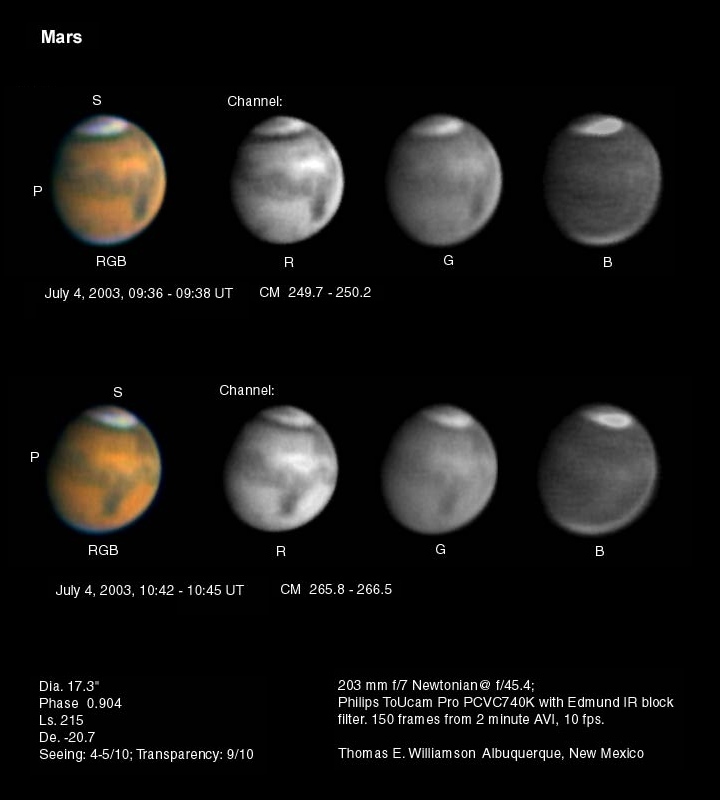 Mk detailed about the present apparition of Mars as characterised as the biggest event ever since the Cro-Magnon astronomers observed. Ok talked about a recent development of plasma fusion technology including the ITER mission and also about the future fusion propulsion that may propel mankind to the planet Mars in the near future. On the evening of 4 May, a discussion time of the CMO members was led by Ok concerning the ccd method. 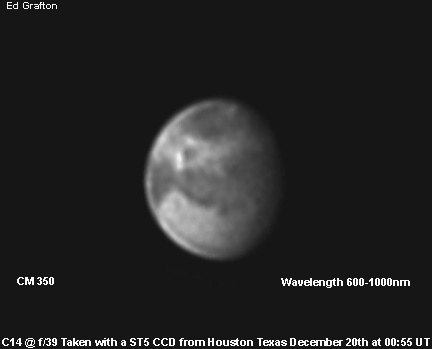 Ok primarily asserted that it should be necessary to choose filters freely in the ccd work. To sort out good images quickly and precisely, he recommended to use SBIG's PlanetMaster. He mentioned a new arrival of KAF-0402ME having a high quantum efficiency for shorter waves, and alluded to ST-7XME. 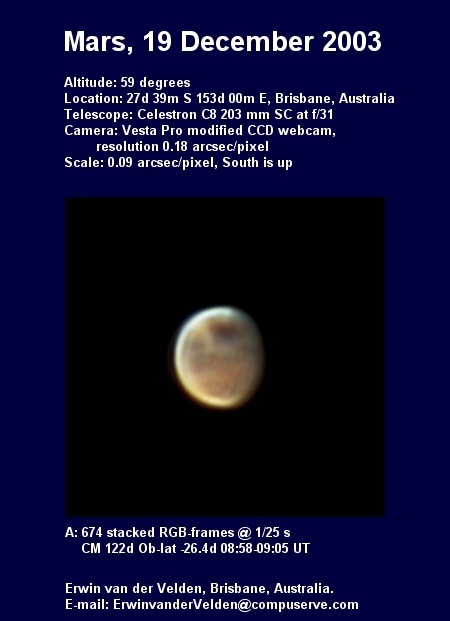 The work by Philips's ToUcam Pro is never convincing to him (as well as to us) since the characteristics of Sony's ICX098BQ are not appropriate for the red planet with white clouds since their R, G, B channels are too mixed to be used for study. On 5 May, we had a conference on the Percival Lowell Problem. Toshio SATO talked about LOWELL in Japan, and Reiko TAKANARI communicated an insight into Lafcadio HEARN in relation with LOWELL. Tamaki SAKASHITA from Anamidzu also gave an address. A furious dust storm was witnessed here at Okinawa on 4 July 2003 (λ=215°Ls) at the eastern area of Deucalionis R, and it played a spectacular variation for a few days at Noachis. 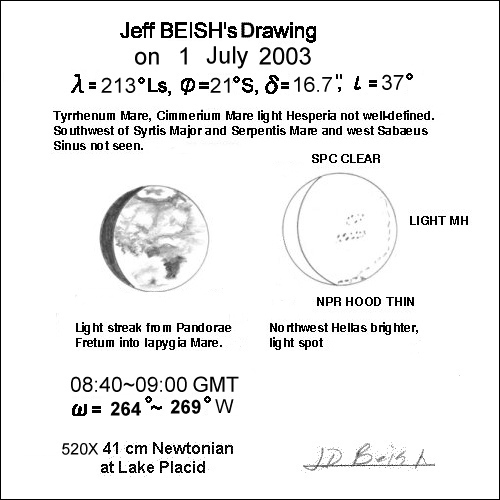 It was first reported around on 1 July (λ=213°Ls) there was observed a precursor of a dense condensation of water vapour/dust around Iapygia Viridis (on 30 June by Sam WHITBY, and on 1 July by Jeff BEISH and Don PARKER : alerted by Jeff), but the dust/condensate reproduction just mildly repeated near there without serious leaps. 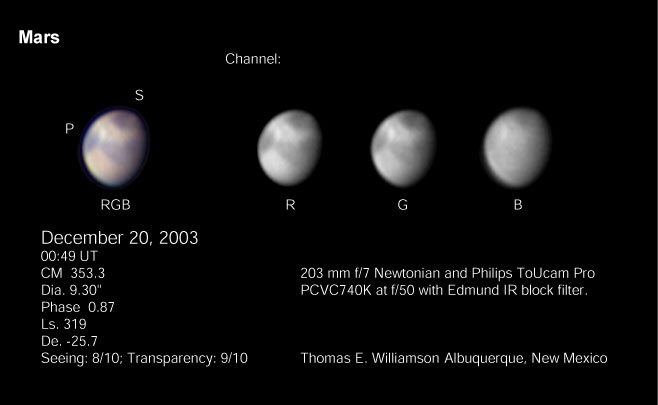 PARKER's images taken on 4 July at 9:54 GMT (ω=254°W) however showed another new germ of dust devil near the morning limb at M Serpentis, and one hour later T E WILLIAMSON, New Mexico, succeeded in obtaining an image at 10:45 GMT (ω=266°W) which already proved that the devil was attaining self-development. Four hours later at around 15 hrs GMT (midnight JST, around ω=320°W) we came to observe the Martian surface further rotated by about 60 degrees, and to find that the dust devil had developed into a furious and spectacular dust storm at M Serpentis through an eastern corner of Deucalionis R. The eastern part of S Sabæus vanished and the dust was about to go down to the northern hemisphere. 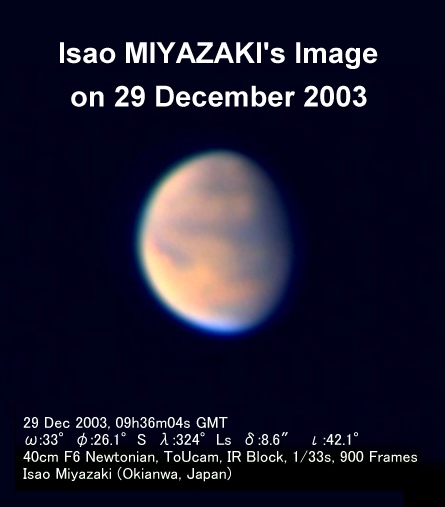 The planet was still low just above the eastern horizon while the dust cloud was very vivid (observed visually by ISHADOH, MIYAZAKI and MINAMI independently). It is rare to catch the sight of the half-concealed S Sabæus, and the storm was really a spectacle. We chased until it went away to the rear side: The remaining western Sabæus was quite dark with a chocolate tinge that was very distinct together with the reddish deserts around there. 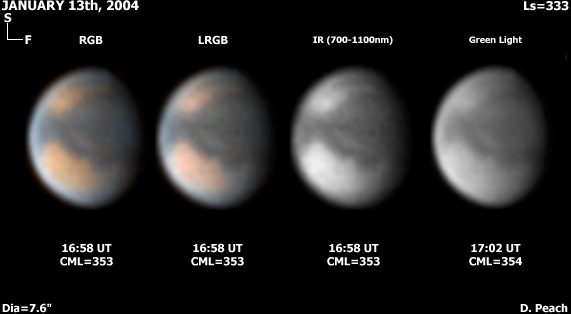 The Martian surface at this season have been quite misty with water vapour mingled with airborne dust as a whole, while we observed that at that moment the region around the western Sabæus was under a high pressure atmosphere and the misty matters looked to have been blown to amidst the dust storm. From the following days the area was regularly watched (every ten degrees from the same angles by MINAMI) from Okinawa how the dust cloud changed. ISHADOH detailed the inside of the core. Any rudimentary dust cloud subsides in the night but it will be rebuilt in the morning if the atmospheric condition remains similar. On 5 July, S Sabæus clearly recovered while the storm quantum jumped into quite a different direction and made a figure of roundish swirl in Noachis. 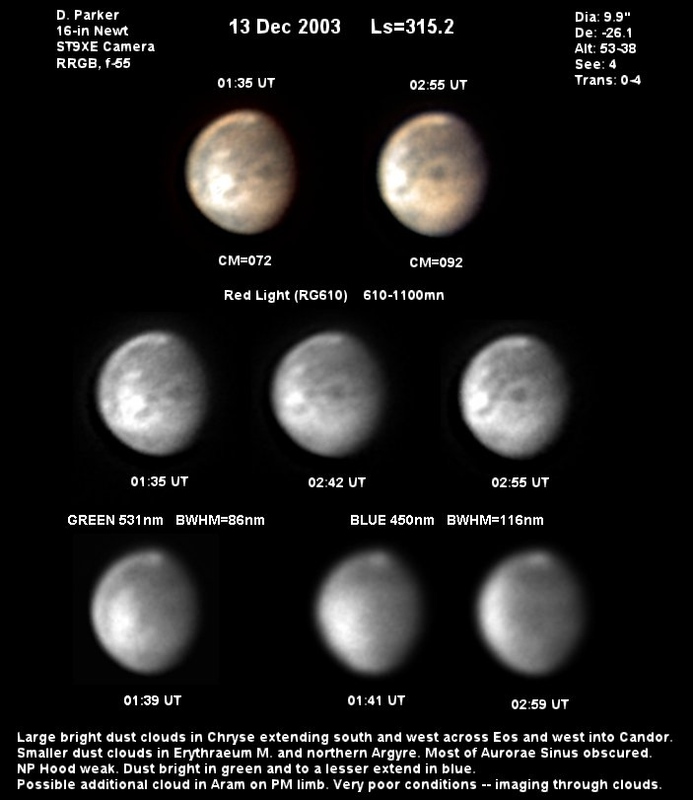 Yaonis Fr and Hellespontus were largely concealed by the dust except for a few shadowy remnants and the dust area appeared large related with the one preceding Hellas. As far as we know the origin of the present dust disturbance had nothing to do with Hellas. Hellas looked to make a feedback largely by the dust from Noachis after 5 July. 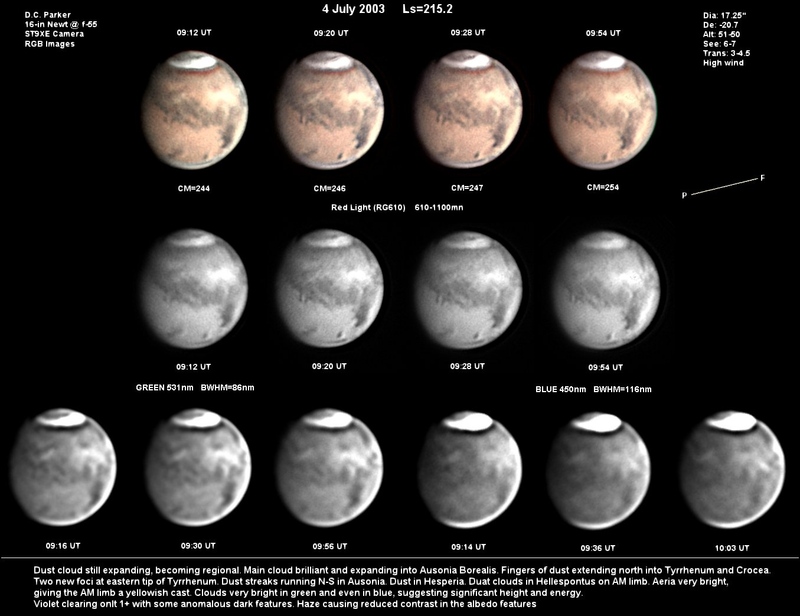 On 6 July the broad band of Hellespontus recovered while its northern end was still cut by a thick dust stream of junction around M Serpentis and the dust core in Noachis made a fat round figure (see MORITA's image) which however looked less vigorous to make a leap. S Sabæus stayed normal (again under the global mist). 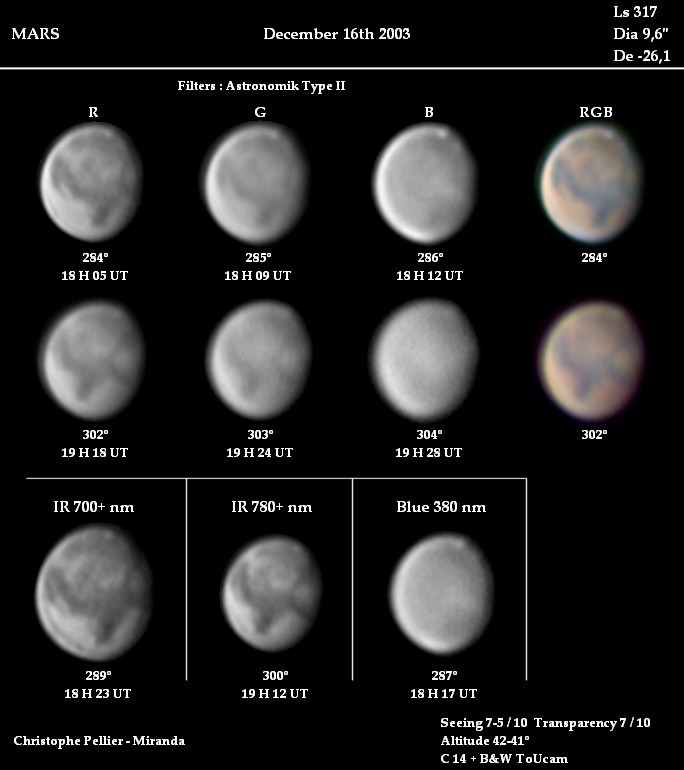 On 7 July, the fat dust figure proved too poor to act in the big stage of Noachis: it looked shrunk, and was about to be lost in a large pond of weakened dust including the Hellas area while Hellespontus again reduced to a shadowy island. 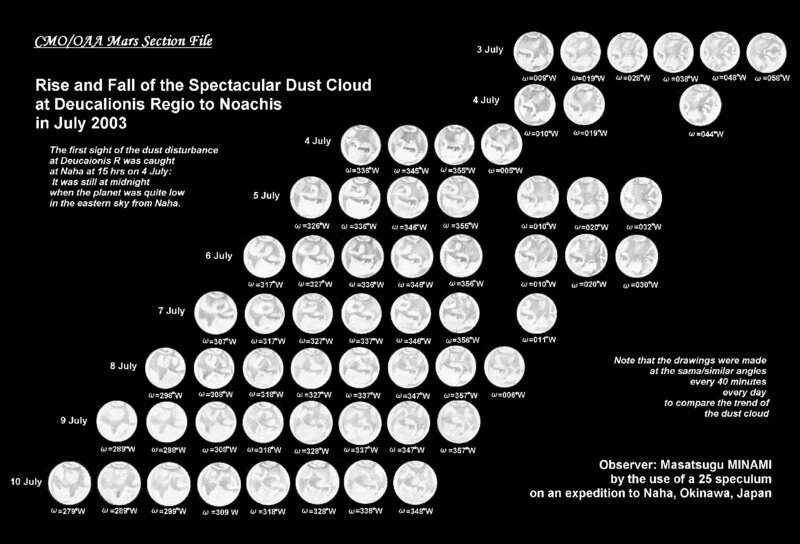 On 8 July the dust has turned thinner and the area of Hellas and Noachis began to appear to be quite normal. In particular the dust remnant was cleared from around the junction area where the storm had been furious. Just the area appears now quite extraordinary compared with the aspect before 3 July as if M Serpentis has been widened and darkened. This is a monument of the furious dust storm on 4 July. The drama of dust storm thus ended, while lots of the airborne dusts must have been brought to the higher atmosphere. Global abundance of airborne dusts may cause an obscuration of the surface markings and as well trigger an onset of another dust storm. The present dust cloud is reminiscent of the bar-like dust cloud (1971a) at M Serpentis detected and observed by EBISAWA and DOLLFUS on 11 and 12 July 1971 (λ=214°Ls) at Meudon. The season is very identical and the 1971a also dissipated soon. It is however well known that later in 1971, the second great dust storm (1971b) started from Noachis which was the greatest ever known until the 2001 dust storm came to be known. Thus we should say we are not yet free from the dust storm or global obscuration since a 2003b dust storm is expected. 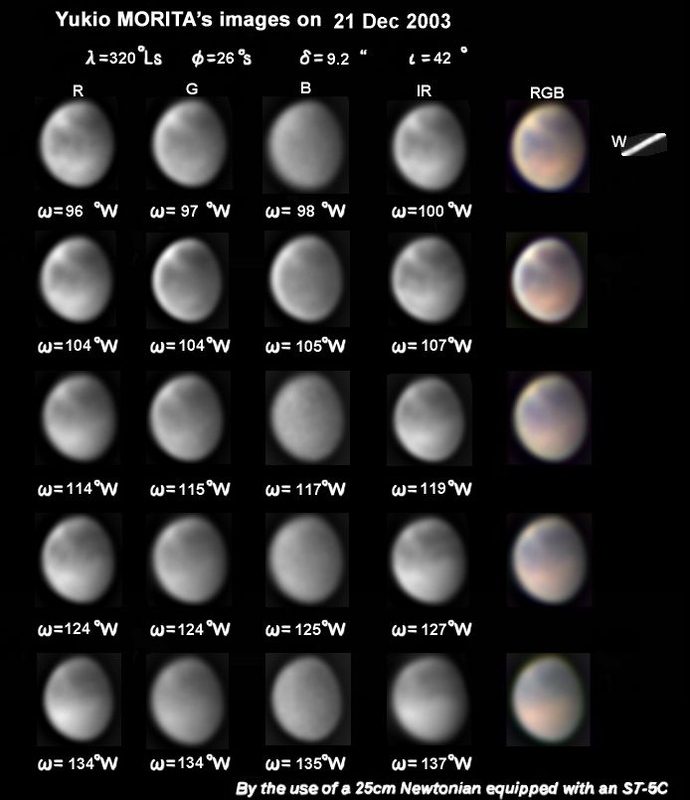 Mars is now big, and on 10 August its angular diameter exceeds the maximum one in the previous perihelic opposition in 1988. 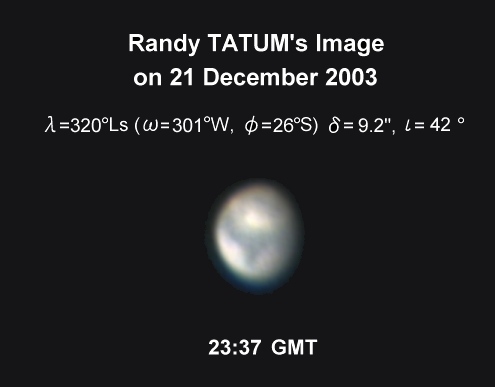 However the Martian surface is now globally covered by a uniform yellow haze made of airborne dusts and water condensates, and so the surface appears quite opaque. 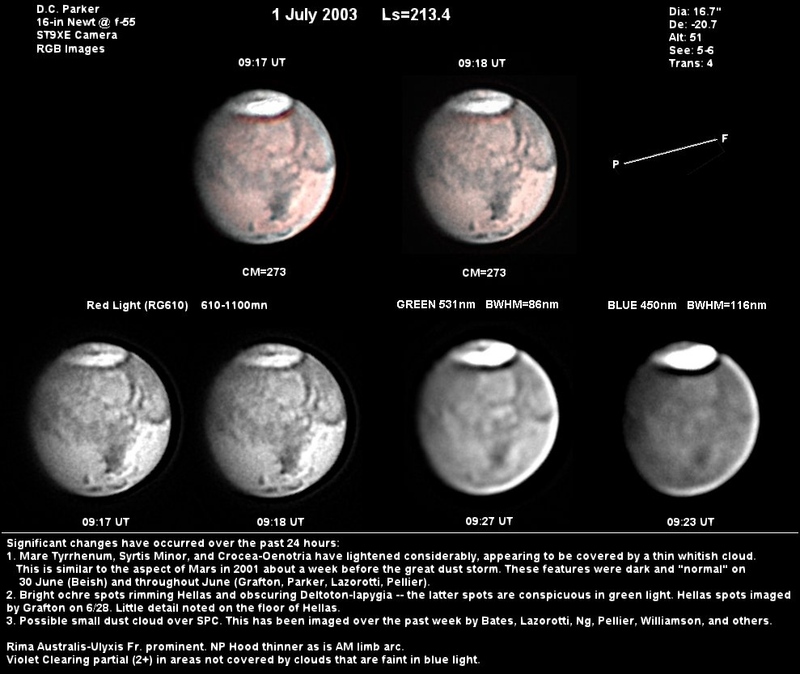 It may be possible to check the insides of the well defined markings and the bright south polar cap, but the markings are in low intensity and as a whole they will appear to be quite faint to the usual eyes (except for the IR eyes). We expect the obscuration will not be thick as in 2001, but we are afraid it may be impossible to see the clear Red Planet during this month: It is not plausible the usual enchanting clear aspect of the Martian markings will recover by the time the planet makes a closest approach to the Earth (on 27 August at 10 GMT). In the meanwhile, the season when the 1956 great dust storm occurred is near at hand. 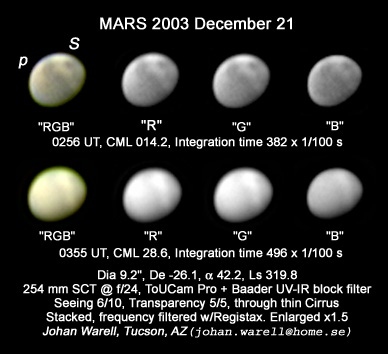 The biggest Mars in history (δ=25.11") was watched by almost all of our members from their ground-based stations on 27 August 2003. The CMO Gallery on the day shows a lot of images made by a total of 25 observers all around the world from France, Italy, Spain, Portugal, USA, Canada, Japan, Hong-Kong and Singapore. 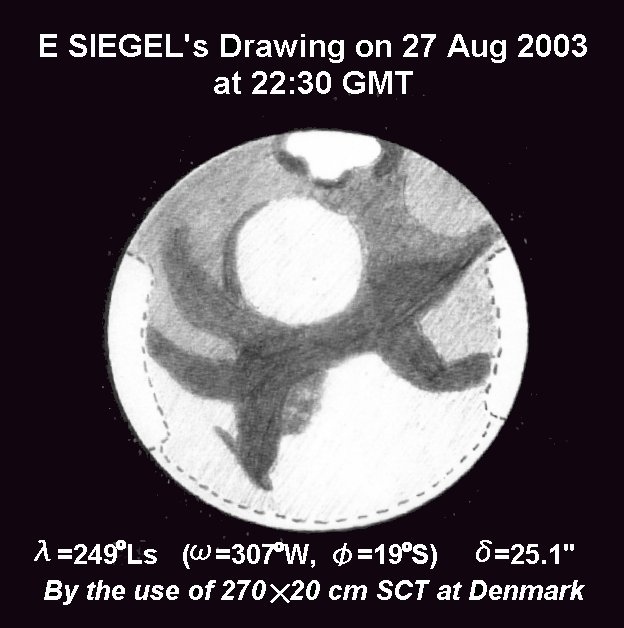 We also received drawings made on 27 August from E SIEGEL in Denmark, and R SCHMUDE in USA. 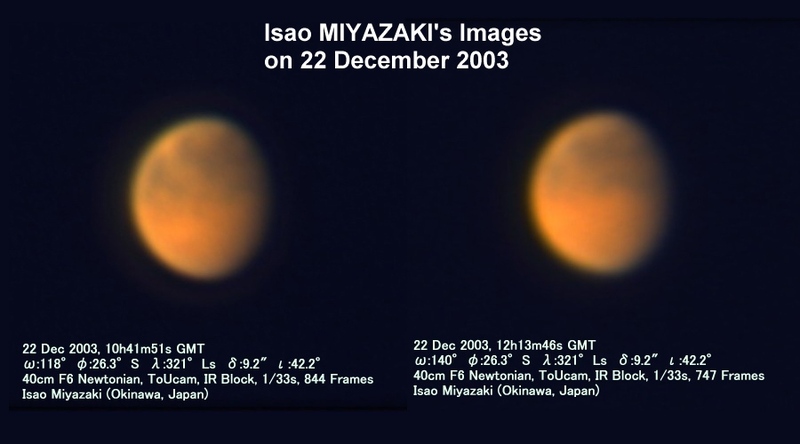 In Japan, the weather was generally poor almost all over the main land, while T IWASAKI and M MURAKAMI visually observed the biggest planet in a lull and T ISHIBASHI took Mars pictures (in addition to T ASADA as already listed). In Okinawa, however, the sky was exceptionally clear all through the night, and H ISHADOH, Y HIGA, I MIYAZAKI, and T WAKUGAWA as well as M MINAMI enjoyed the biggest Mars. 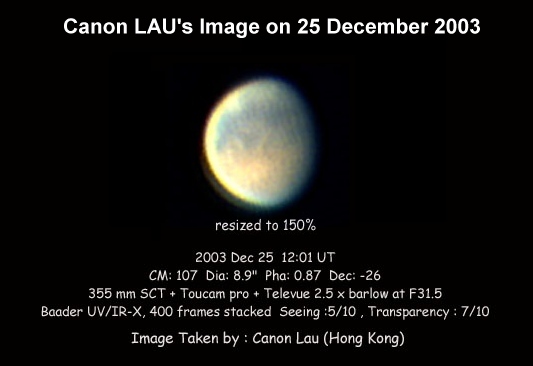 At 10 hrs GMT when it was predicted to be closest to the Earth, the planet was clearly seen above the eastern horizon from Okinawa. Just near at midnight, the planet should have been closest to Okinawa when the seeing was good. 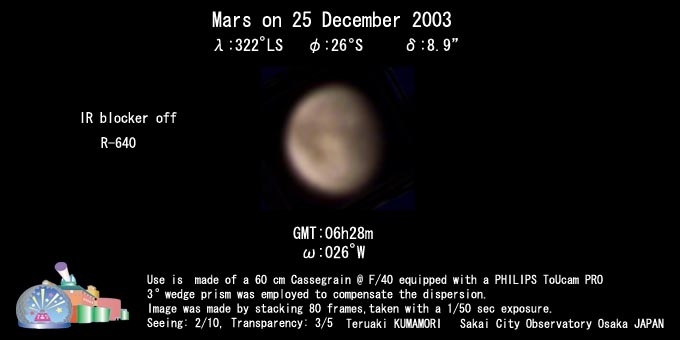 M MINAMI observed from 11:40 to 18:30 GMT. We should further report that we received several excellent colour drawings made during the opposition period by Alan HEATH, Harold HILL and David GRAHAM from England. Bill SHEEHAN stayed two weeks from 28 August at the Lick Observatory and secured several interesting drawings by the use of the famous 90 cm refractor that E E BARNARD once utilised (cf the CMO-Gallery). 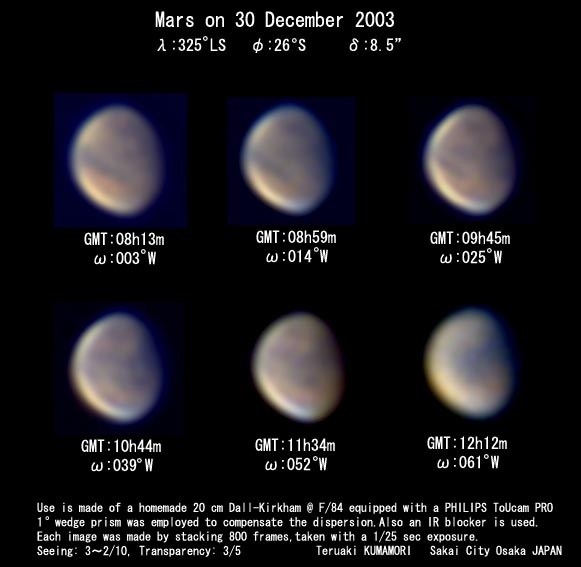 The area of Mare Serpentis was largely deformed and singular as apparent since the time of occurrence of a serious dust disturbance around there onset on 4 July 2003 (see C ). 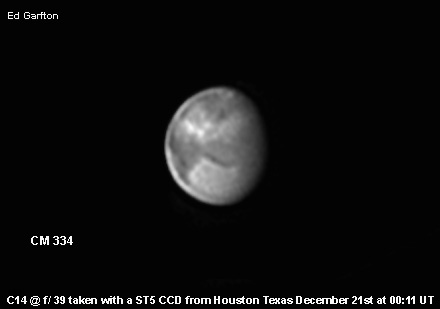 The area turned to take from 8 July quite a different shape/density from the former, while it seems that the area has not yet restored for these periods of more than five months, and M Serpentis looks still widened and darkened. Description of the area has been thus of crucial importance during this apparition. See a sequence of images here made by the images by Don PARKER, C PELLIER, Y MORITA and T KUMAMORI around at ω=328°W from 26 June to 2 December. 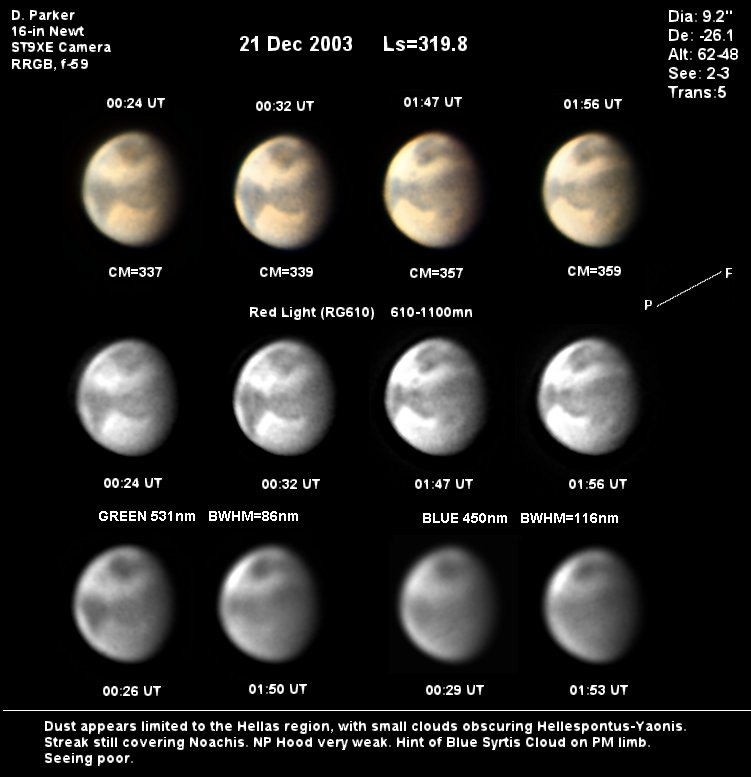 The final significant Martian event in 2003 was the dust storm detected by Don PARKER on 13 December 2003 (λ=315°Ls). It was already large spread from the southern Chryse to Argyre so that it was suspected it had been entrained the day before. 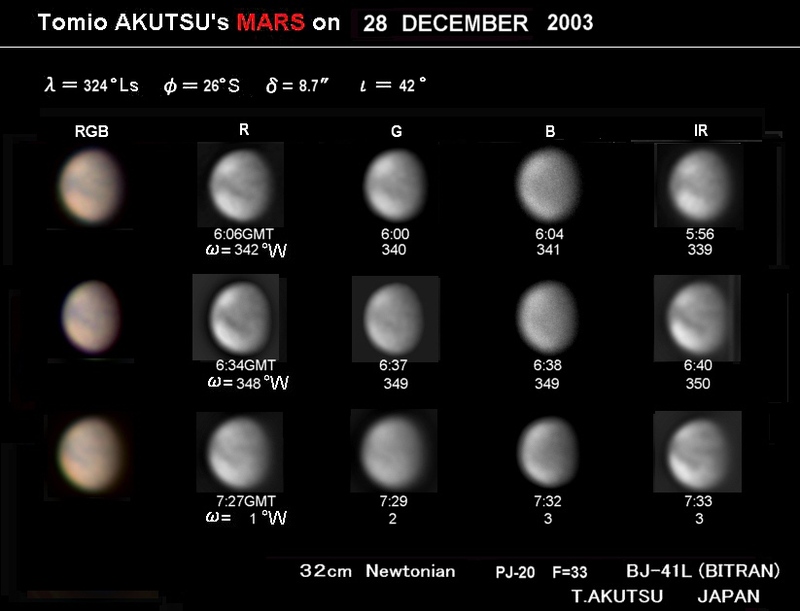 Soon on 14 December the western border of the dust was observed in Japan by Tomi AKUTSU and Teru KUMAMORI . 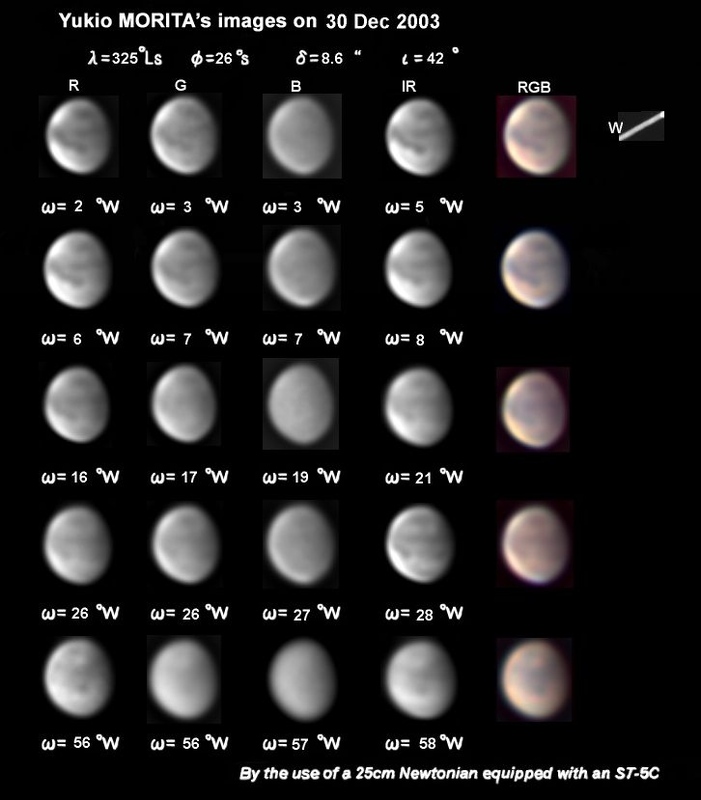 On 16 December the disturbance propagated deeply to Noachis, and Ch PELLIER detected next Martian morning a conspicuous leap over the area of M Serpentis. 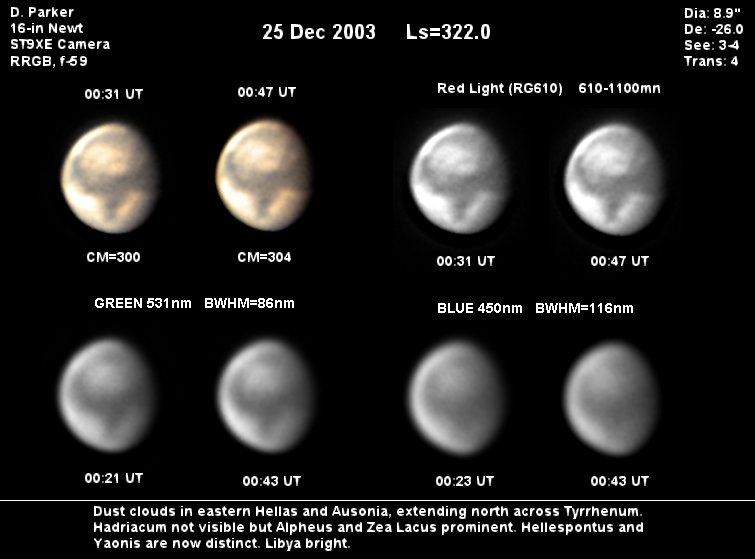 On 19 to 20 December, the dust cloud was witnessed over Hellas by Ed GRAFTON and Tom WILLIAMSON . Erwin van der VELDEN checked the dust tail at the west of Argyre. 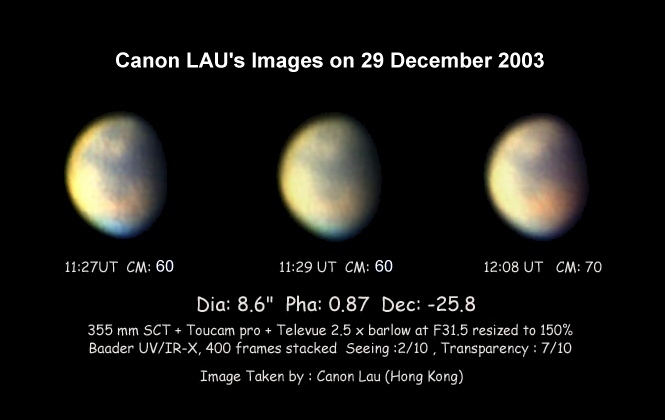 Around 21 and 22 December, the phenomenon was traced by PARKER , GRAFTON , Johan WARELL , KUMAMORI , Yuki MORITA , Van der VELDEN , Isao MIYAZAKI , Randy TATUM and others. On 25 December the dust was still prominent over Hellas (PARKER ), and still erased Margaritifer S ( KUMAMORI , MINAMI): Canon LAU checked the western border. On 27 December, Maurice VALIMBERTI showed the dark area from Aurorae S to M Erythraeum, but the surface was not yet clear. It was certain the southern higher latitude areas had already been encircled by the dust. 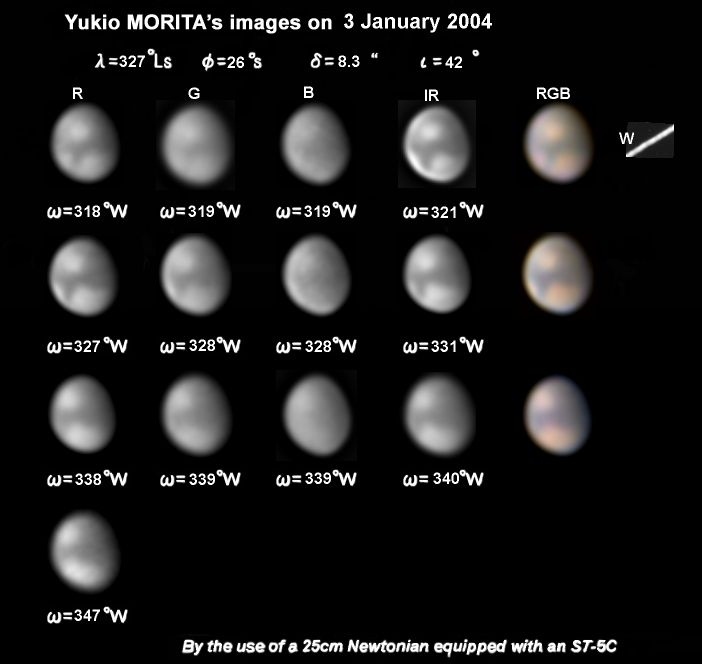 On 29 and 30 December (λ=325°Ls), the larger region of Noachis to Argyre was observed by Van der VELDEN , AKUTSU , KUMAMORI , MORITA , MIYAZAKI , LAU and others. There was no bright core any longer, but MIYAZAKI and MINAMI felt that the markings were still fainter. 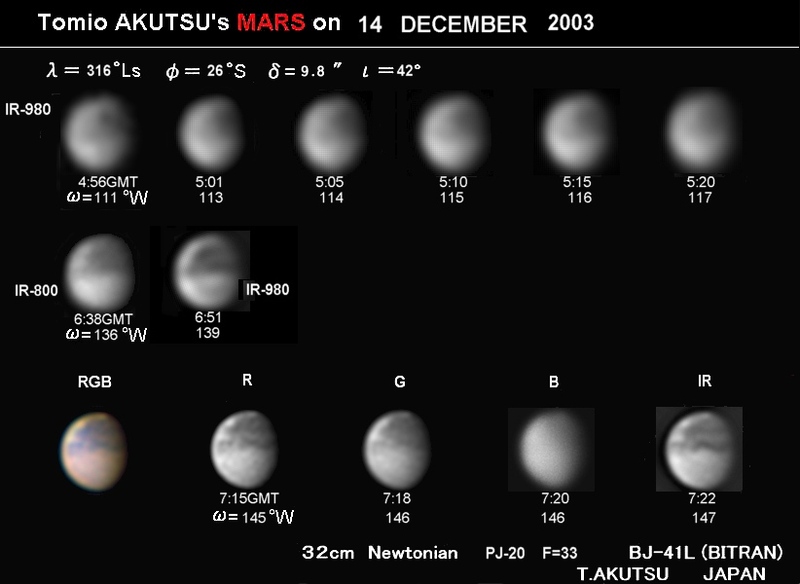 LAU and MINAMI observed that the area of Argyre turned rather whitish largely on the morning side. 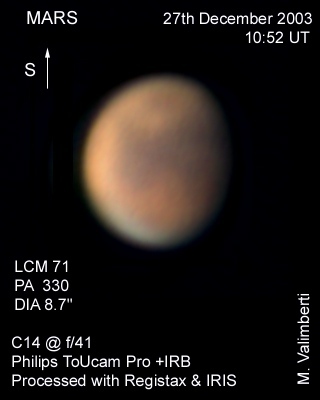 As the New Year came in, no thick dust was seen while such an area of Hellas looked still slightly dusty. The area in question of M Serpentis was shot widely dark by MORITA on 3 January 2004 at ω=327°W, while the image by Damian PEACH later on 13 January might suggest there had been made a certain change.